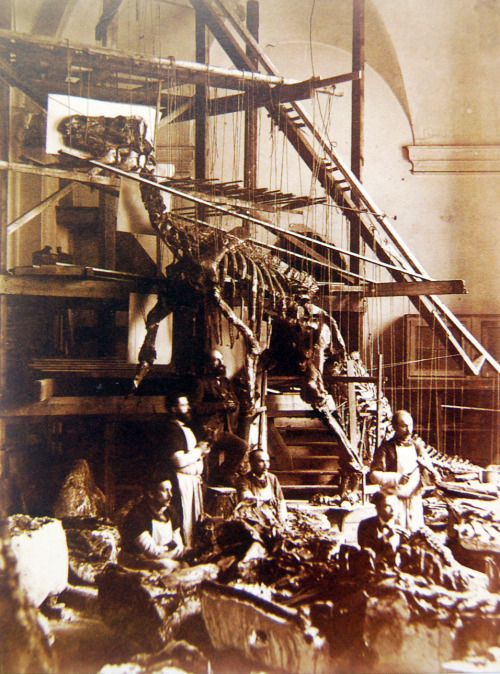 Workmen mounting the first Iguanodon bernissartensis skeleton in the St. George Chapel in Brussels, 1882. Because Belgium did not really possess a tradition in mounting vertebrate specimens, Dollo’s men had to invent their own method. Although they successfully mounted a great number of specimens (who are now on display in the Brussels Museum of Natural History), their solution meant that unmounting the animals was near to impossible without physically damaging them. These days, the Brussels Iguanodons have become museum specimens in more than one way, illustrating the evolution of mounting such animals in museums in the nineteenth century.